Christian Ramirez was born in the USA, moved to Colombia soon after and then returned, with his family hoping to see him thrive. At his first U.S. national team camp, they're getting the chance to do just that–in person. When it comes to the U.S. men's national team's January camp and new recruits hoping to make strong first impressions, Christian Ramirez is at the top of the list of the 15 uncapped players not taking anything for granted. “I have 18 days to prove myself to this coaching staff and my teammates and to give everything I can for this team and this country,” Ramirez told SI.com this week from California, where he is making his first–and some may say overdue–appearance in the red, white and blue. 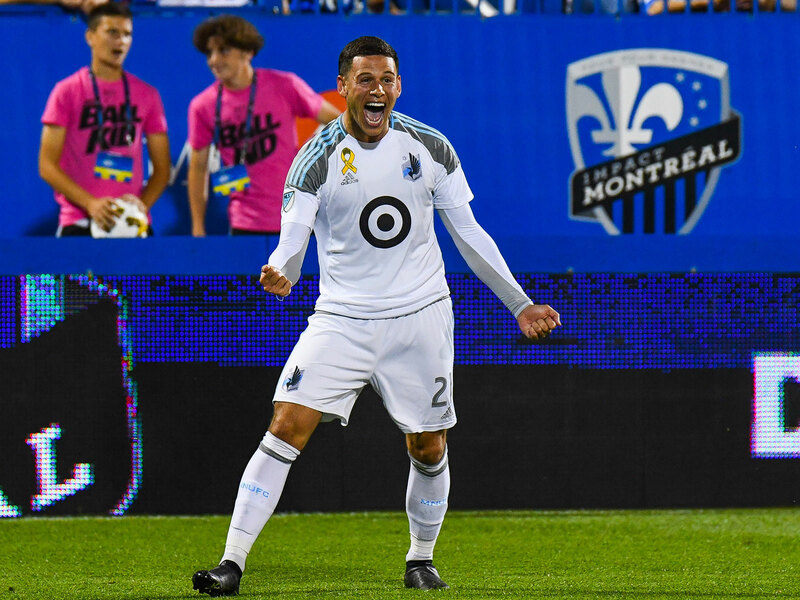 The 26-year-old striker, who scored 14 goals on his debut MLS season for Minnesota United after being a constant threat in U.S. Soccer's lower divisions, is doing everything he can to prove to interim head coach Dave Sarachan that he belongs there–on and off the field. When he’s not training, for example, Ramirez spends almost every moment with his teammates, with the simple philosophy that the more he gets to know them as people, it helps him understand who they are as players. Ramirez may have one of the more unique stories of them all. The son of Colombian immigrants, Ramirez was born in Santa Ana, California. But almost immediately after his birth, his father lost his job, so the family moved to Envigado, a town southeast of Medellin in Colombia. His father’s thinking was that returning to his native country would mean a more comfortable life for the family and a chance to press the restart button on his career. But as the years went by, he realized he had given up on the U.S. too quickly and decided it was time for the family to rejuvenate its American dream. Six years later, they returned to the States. The town Ramirez grew up in is roughly 30 miles away from StubHub Center in Carson, so his family has been able to visit camp a few times, not just to see him train but also to catch a glimpse of a Ramirez wearing the U.S. uniform. For Ramirez and his family, this invitation to January camp is a symbolic graduation–a chance for them to see that all the hard work has paid off. “The way my dad said it was, ‘I left my country in Colombia to give you a better life and seeing you living out your dream and putting on these colors really means everything,’” Ramirez said. The emotion beams in his voice as he continues to explain his own feelings when seeing his parents watching him from the stands. The future looks bright for Ramirez, who will also become a father in April as he and his wife, Valerie, are expecting a daughter. "Terrified" is about the last characteristic Ramirez displays on the field. It’s challenging to pinpoint his style as a forward. There’s the poacher aspect, one who constantly searches for the right delivery on which he can pounce. There’s also the pacey striker, who fades off on the left wing with velocity, cuts inside and finishes off. Or there’s the hold-up striker, waiting for his teammates for support, provides the one-two and then capitalizes on the defender’s slow reactions. Whatever characteristic he gives you, one thing is for certain: Ramirez is a workaholic, and he can attribute that to his genes. A striker typically requires a degree of greed and self-centered thinking, Ramirez offers a different set of qualities. Since his college days at UC Santa Barbara and Concordia University Irvine, he’s always been known for his team-first, blue-collar mentality where the joy of scoring is only secondary to team success. Before settling for an attacking role, Ramirez started his college career as a center back and then a midfielder, and it’s his versatile background that helped him become a unique forward. “I know what defenders are looking for, and I’ve always had the midfielders passing mentality in my game so this has helped me be a different kind of forward," he said. Despite the fact that he wasn’t drafted out of college, Ramirez signed with the Charlotte Eagles (USL Pro) in 2013, scoring 12 goals in his first season and playing for the league title against Adrian Heath’s Orlando City. It was one of the craziest finals in U.S. soccer history where Orlando’s Dom Dwyer scored four goals to combat Ramirez’s brace in a 7-4 Orlando triumph. Heath would remember his performance. The following year, Minnesota United, then in NASL, signed Ramirez and was set to play a backup role to first-choice striker Pablo Campos. But when Campos suffered a torn ACL in preseason, Ramirez stepped up. As a result, he scored 20 league goals and won the 2014 Golden Boot. He won the Golden Boot again in 2016 and formed a great partnership with Miguel Ibarra, as Loon fans dubbed them as Batman (Ibarra) and Superman (Ramirez). But while Ibarra received more recognition and was called on by Jurgen Klinsmann for the U.S. team in 2014 and 2015, Ramirez kept waiting. Once Heath signed on as Minnesota’s head coach, Ramirez was signed to an MLS contract. Last March against Portland Timbers, he scored the team’s first goal in MLS play. But for Ramirez, the individual accolades mean very little as the ultimate goal is to make the playoffs, and Minnesota fell short during its expansion year. For now, however, the focus is fully on training camp and the chance of wearing the U.S. jersey against Bosnia-Herzegovina on Jan. 28. This may just be just a friendly but it’s also an opportunity for the U.S. men to continue to turn the page after shockingly failing to qualify for the World Cup for the first time since 1986. And for the players in camp, it's a chance to prove they belong as part of the foundation to take the nation forward. For Christian Ramirez, after a lengthy wait, a winding road and a call that finally came, the time to seize this opportunity is right now.